Trevor Pateman's Philately Blog: "Roughly Opened" - That's Good News! Auction catalogues frequently describe covers as "roughly opened". This is a sort of apology and is meant to indicate that they have somewhat reduced the Estimate because of the rough opening. To me, "roughly opened" is often a bonus: it indicates with some high probability that (a) the envelope was received by someone and (b) that they did not think of the envelope as a philatelic cover. That is valuable information! Auction catalogues also describe covers, with great frequency, as "slightly reduced" or " cut down". What this usually means is that some collector did not like "roughly opened" covers and so trimmed them whenever one came into his or her collection. Even today, collectors vandalise covers like this - sometimes very expensive covers. As a result, we lose some valuable information which helps us decide whether a cover has travelled and whether it is non-philatelic. 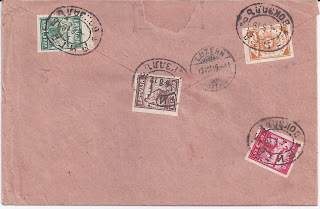 Here is an interesting cover which, over decades, has been attacked by philatelists. 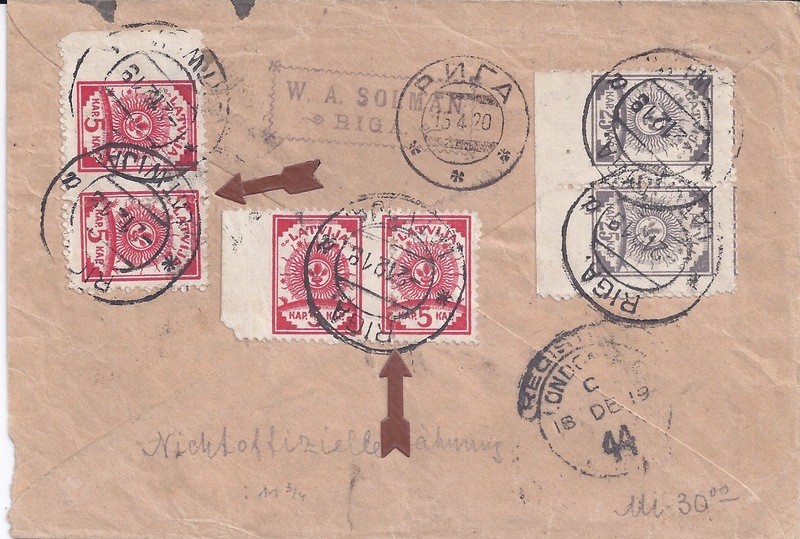 It started out in August 1919 as business correspondence from the stamp dealer W A Solman in Riga addressed to the stamp dealer Bela Szekula in Switzerland. It's main interest is that it was registered at the Riga Railway Station post office, where both an old Imperial Russian internal Registration label (overwritten with Latin "Riga") and an old Imperial cancellation were used. 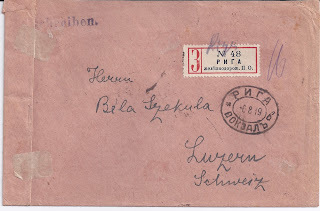 As it happens, the letter was sent on 6 August 1919 which Harry von Hofmann gives as the date at which this post office (re-) opened under Latvian control - maybe this cover was the source of his information. 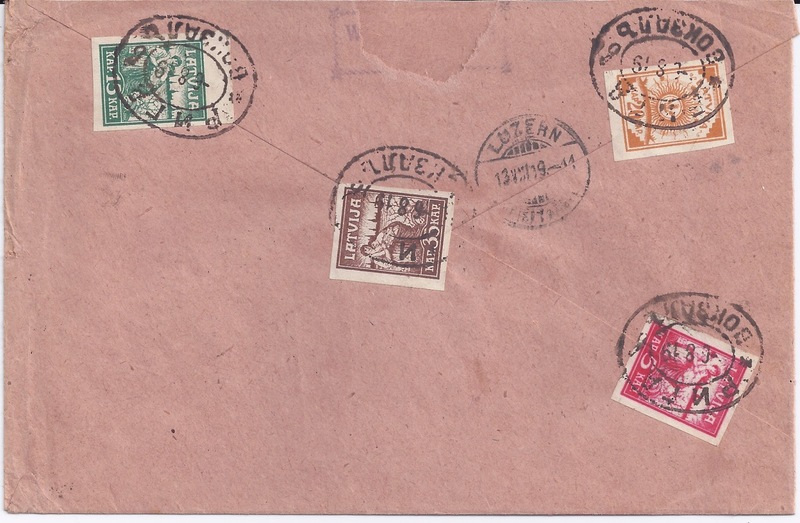 Solman did put on a set of "Liberation of Riga" stamps as franking but also used them as seals. The stamps were widely available. The cover arrived in Luzern very quickly, on 13 VIII 19. I don't think Szekula thought much of the cover - I think he opened it roughly. I think this because the cover has been cut down at the top by maybe 5 mm. Someone has "tidied it up". 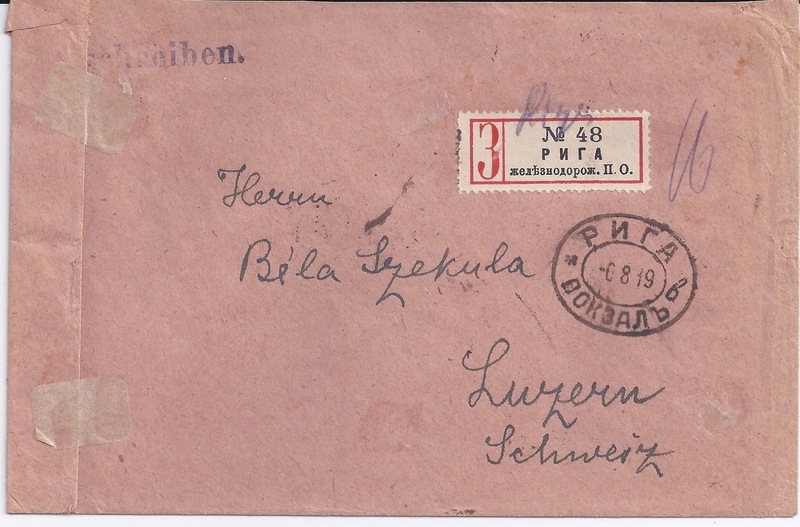 Probably, Szekula put out this envelope for sale in his shop but tore out the W A Solman handstamp on the back of the cover so that his clients could not make direct contact with his source. I will prove in a moment that there was a Solman cachet on this envelope. Later, someone thought this cover was too big and folded it over at the left and sealed down the fold with hinges. This damage could be partly reversed. So too could the small amount of damage caused by the four or five hinges applied to the front of the cover when it was "mounted" to display the back. Here's another Solman cover which started out as a quite philatelic item and then acquired some fascinating non-philatelic aspects. 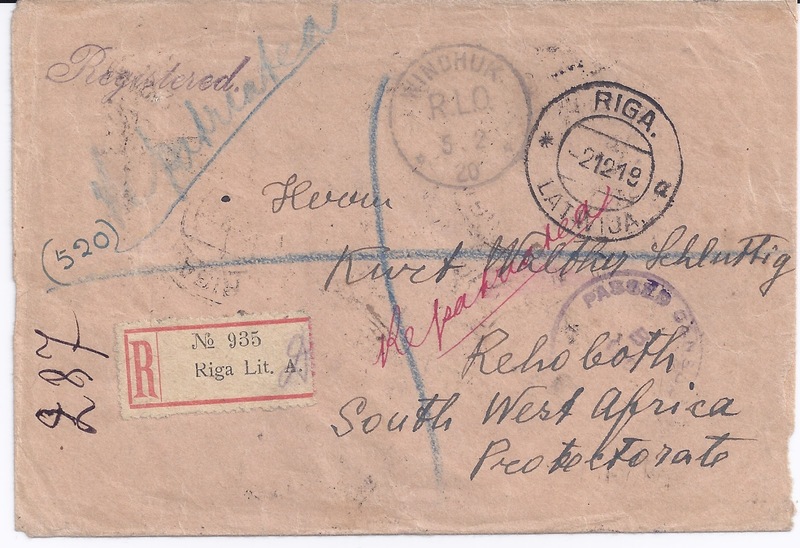 This cover started out from Riga on 2 12 19. There is an Imperial Russian registration label but a new style RIGA LATWIJA -2 12 19 cancel on the front. It's addressed to South West Africa! Since that territory was now under British control, the letter headed for London where it picked up a transit cancel on 18 December and then was sent down to Africa. There it picked up a violet Passed by Censor cachet and a WINDHUK R.L.O. 5 2 20 cancellation. I don't know if "R.L.O." stands for Registered Letter Office or Returned Letter Office - the latter is possible because this letter was returned. Across the front i red is written "Repatriated" and again in blue crayon "Repatriated". 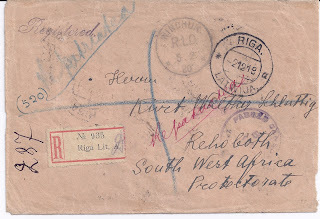 And the cover made it back to Riga - there is a Cyrillic "RIGA 15 4 20" on the reverse. 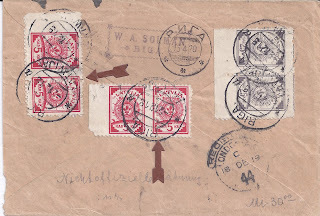 The cover is franked with stamps which have been unofficially perforated; the 5 kopeck stamps are imperforate between and the 25 kopeck a bit misperforated. I suspect this was Solman's work - his cachet is on the reverse of the cover at the top. It's the same cachet as that which was once on the Szekula cover. Someone has pasted arrows on to the cover so that we don't miss the imperforate between and someone (else?) had pencilled "Nichtoffiziellzähnung : 11 3/4" - information which should be on an album page. The damage here is partly reversible though the arrows will require steaming. The "Mi 30 oo" can also be got rid of. In this case, my feeling is that the journey made by this cover and the reason for its return add greatly to the postal historical interest of what could have been a cover mainly of interest for its evidence of stamp dealer activity. Both these covers are for sale.